Days of cool rain marked the year’s transition from September to October. The harvest moon remained hidden behind deep clouds. Yesterday, temperatures and humidity rose dramatically. This afternoon the sun broke through the clouds lifting the temperature to 86F, quite a change from highs in the mid-sixties at the weekend. Certain signs of autumn belie today’s warm weather. 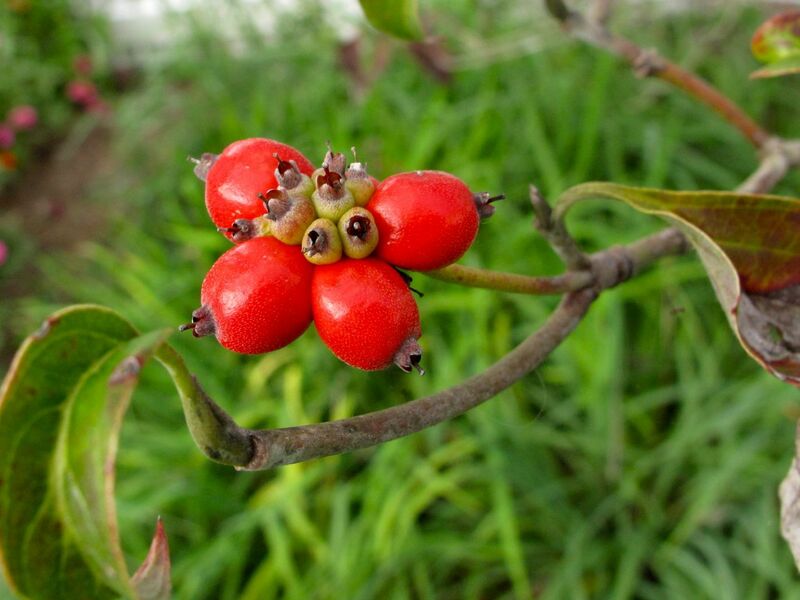 Berries now adorn the Flowering Dogwood, whose leaves had already browned in July’s extended dry spell. A windblown spire of Salvia uliginosa ‘Blue Sky’ (Bog sage) rests against of Hylotelephium ‘Herbstfreude’ Autumn Joy (Stonecrop). The Salvia’s pink calyx reflects the ruddy, rusty hue of the flowering Stonecrop. 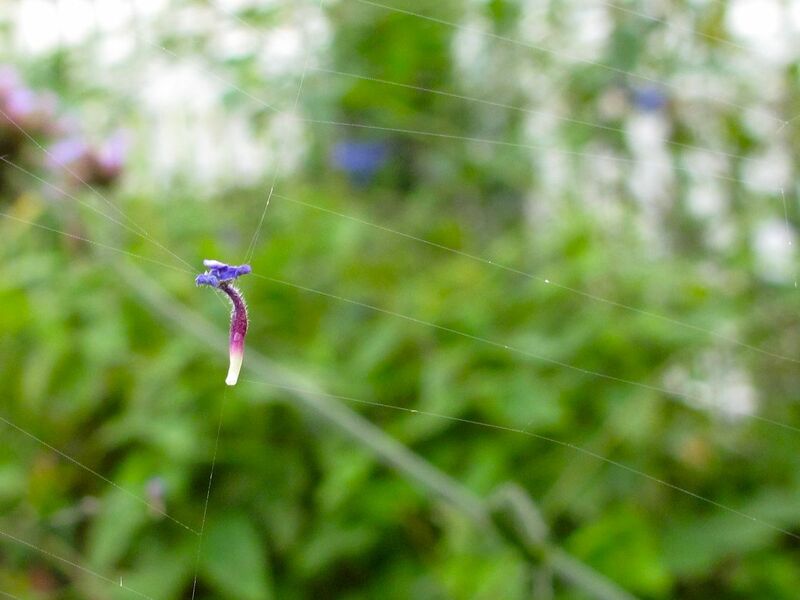 A multicolored flower petal of ‘Blue Sky’ Salvia sits suspended in a spider’s complex world. 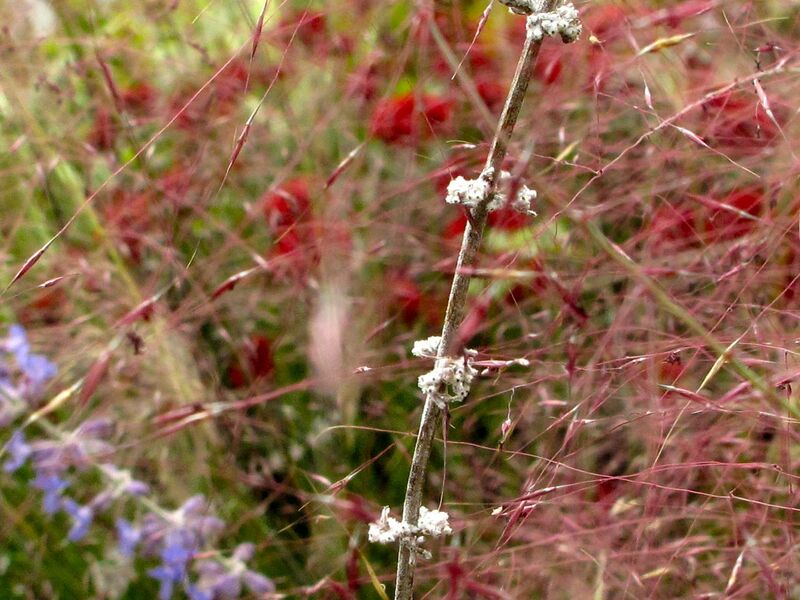 The burgundy Chrysanthemum in the background has bloomed most of the summer and now complements the rose-colored wisps of fall-blooming Muhlenbergia capillaris (Pink Muhly Grass). In the foreground stands a spent stalk of Perovskia atriplicifolia (Russian Sage). Blue-violet Ageratum brightens a dark corner of the garden. 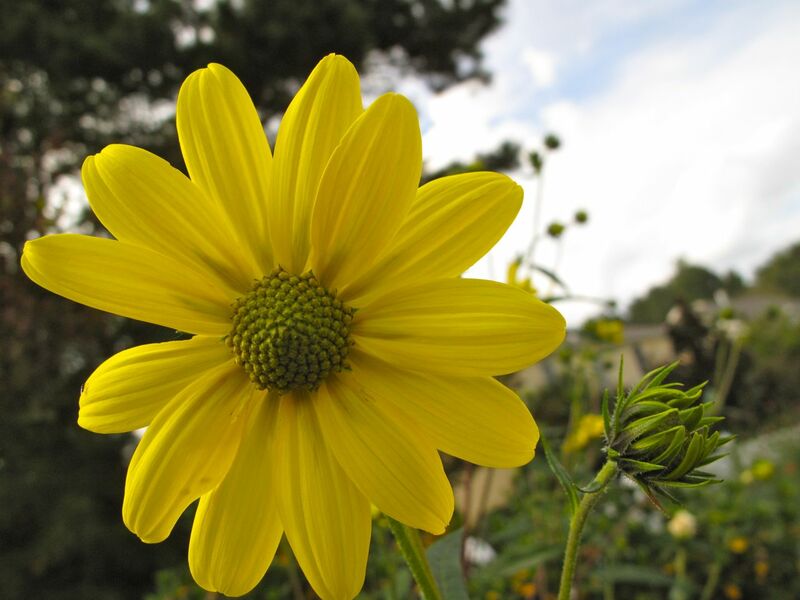 Helianthus angustifolius (Swamp Sunflower), became very aggressive and was theoretically removed from the garden a few years ago. 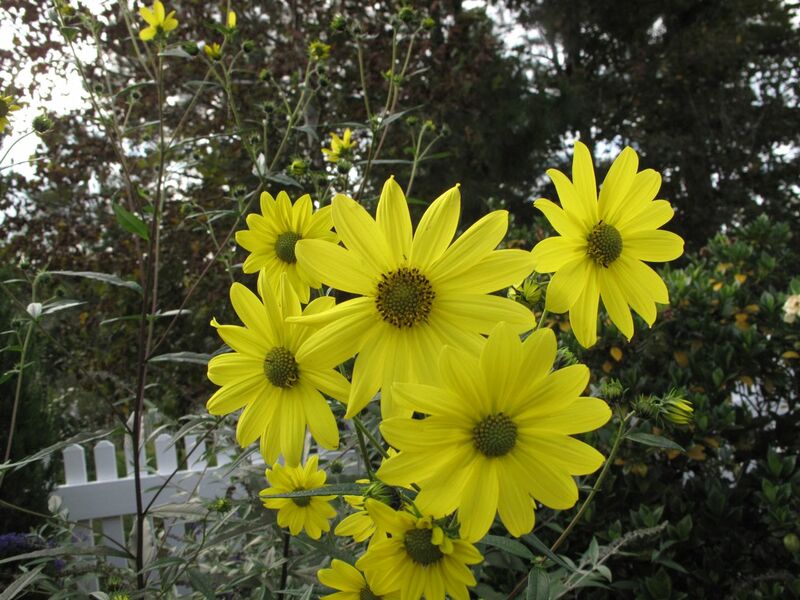 Unaware of its banished status, it displays brilliant yellow blossoms annually. The annual, Angelonia angustifolia ‘Angelface Blue’ (Summer Snapdragon), has bloomed throughout the summer among the stepping stones of the meditation circle. The meditation circle itself is soggy this week and needs attention. Pine-bark mulch now sits in drifts, having been swept across the stone paths during the recent heavy rainfalls. Penstemon digitalis ‘Husker Red’ (Beardtongue) still performs satisfactorily, while generous green mounds of Thyme surpass expectations. 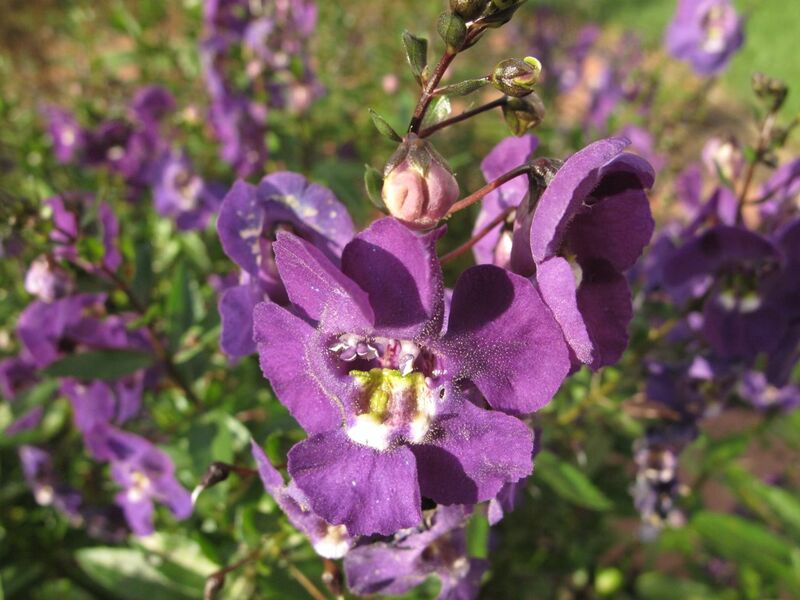 Unfortunately other evergreen perennials that were chosen specifically for their drought-tolerance, Iberis sempervirens ‘Purity’ (Candytuft) and ‘Pikes Peak Purple’ Penstemon (Beardtongue), are brown and may not recover. ‘Purity’ was beautiful all winter and spring and ‘Pikes Peak Purple’ was lovely in spring, but both choices will need to be reevaluated for long-term performance. This entry was posted in garden and tagged ageratum, almanac, angelonia, Autumn Joy Sedum, candytuft, iberis sempervirens, meditation circle, meditation garden, meditation path, nature photography, penstemon, perennials, Perovskia atriplicifolia, photographing nature, pink muhly grass, Salvia 'Blue Sky', Swamp Sunflower on October 3, 2012 by pbmgarden. 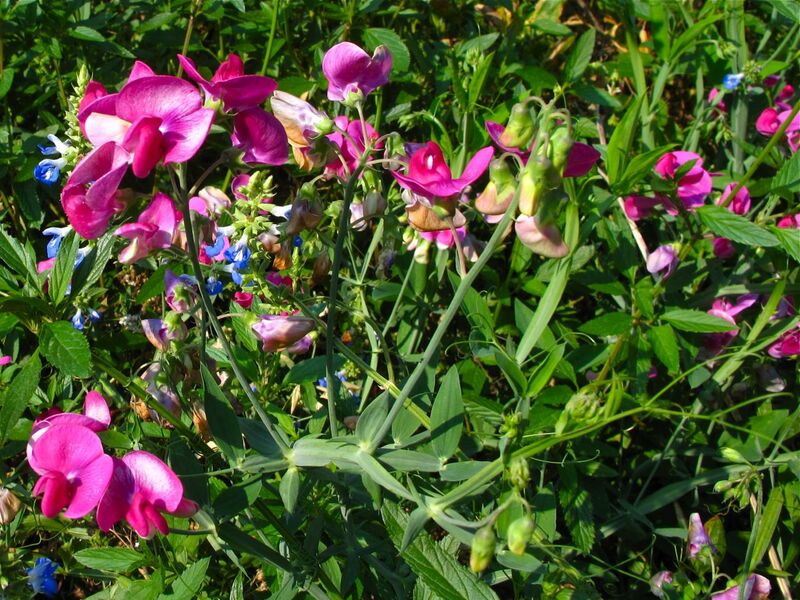 In the southern border this week Lathyrus latifolius (Everlasting Sweet Pea) is reblooming. 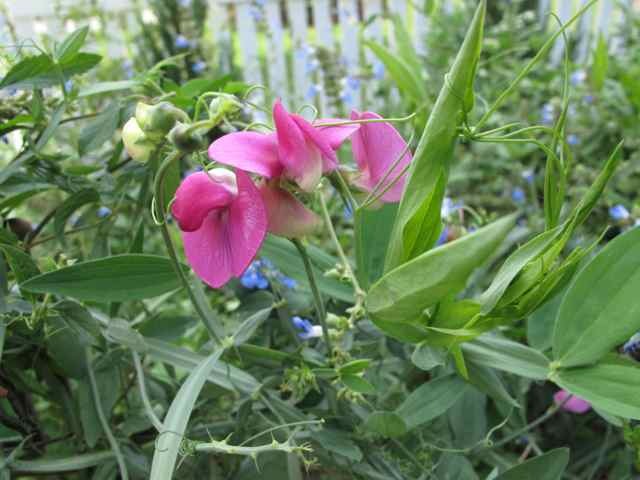 Normally, this Sweet Pea would have died back by this time of year, but instead it has lush green foliage and many cluster of pink, presumably stimulated by this summer’s odd heat and rain patterns. In its current sunny garden location this Sweet Pea vine has higher aspirations for climbing than its trellis can support, so for now it is forced to sprawl among its neighbor, Salvia uliginosa ‘Blue Sky’ (Bog sage). This perennial came from my previous (and shady) garden eleven years ago, one of many pass-along plants from a dear relative. Though not fragrant, the pink blossoms hold a certain old-fashioned charm. 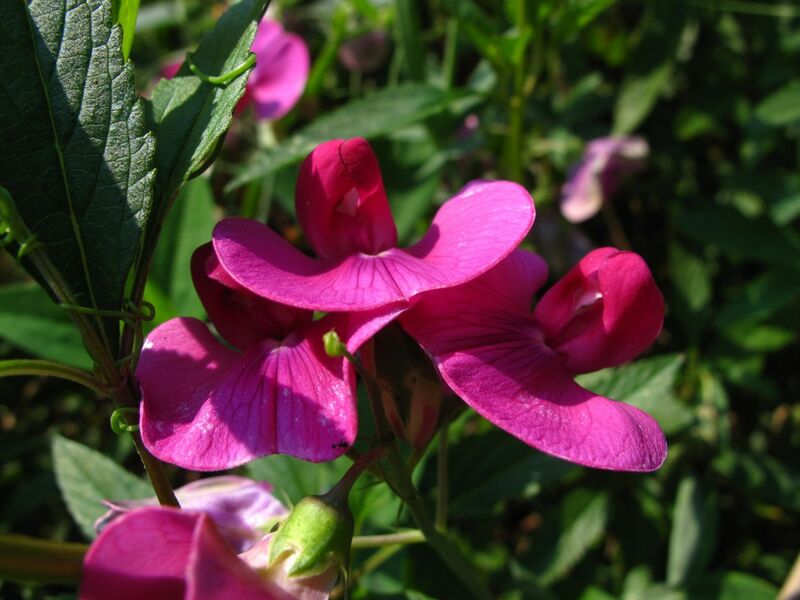 This entry was posted in garden and tagged nature photography, pass-along plant, perennials, photographing nature, Salvia 'Blue Sky', sweet pea on August 5, 2012 by pbmgarden. Fragrant Gardenia jasminoides ‘Chuck Hayes’ and a few other plants are newly blooming in this Chapel Hill garden today. Long before the garden’s picket fence was installed ‘Chuck Hayes’ was planted as a low privacy hedge in the western border. 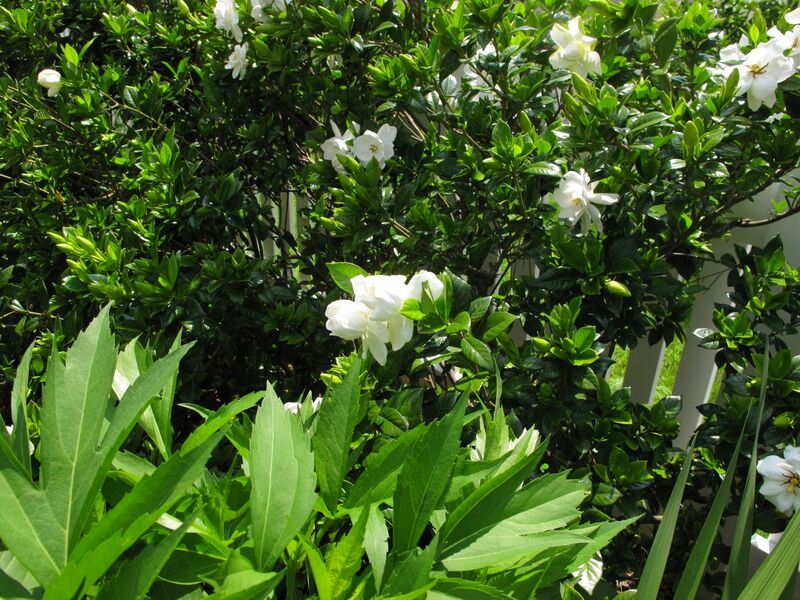 Both evergreen and deer resistant this gardenia variety is very cold hardy in this area. 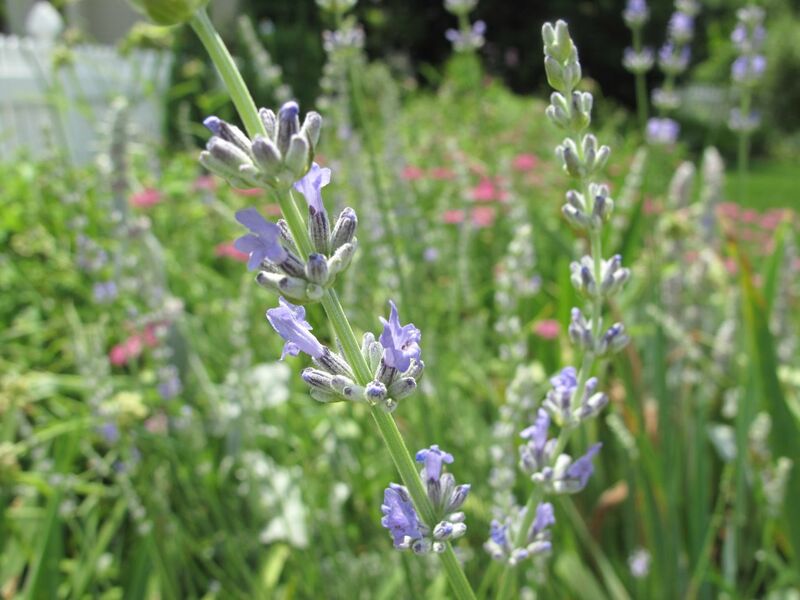 It prefers regular watering, but seldom is anything watered in this garden beyond a week or two after planting. The hedge is benefitting from the very significant amounts of rain the garden has received all winter and spring. It also responded well to the Epsom salts I applied a month ago when some of the leaves began to yellow. 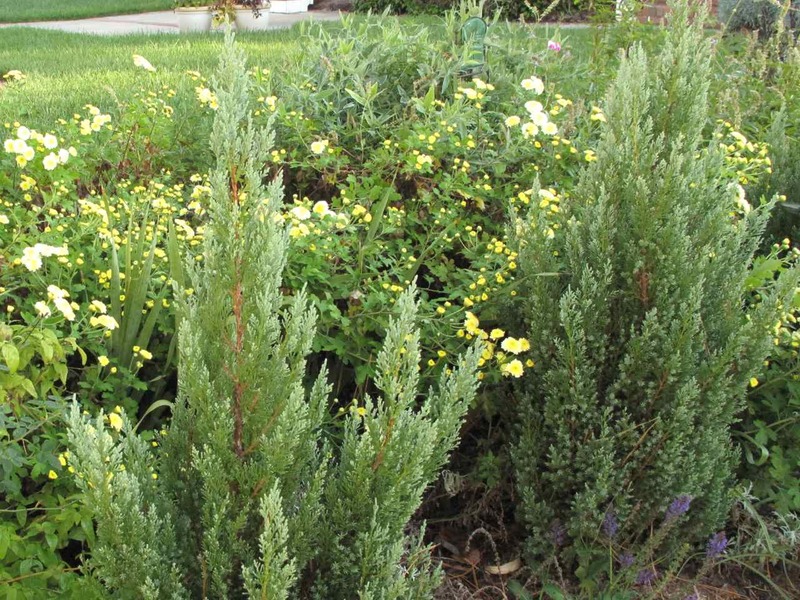 Many of the original ‘Chuck Hayes’ shrubs were lost to drought and the spots left bare are gradually being replaced with taller plants that can provide more privacy. 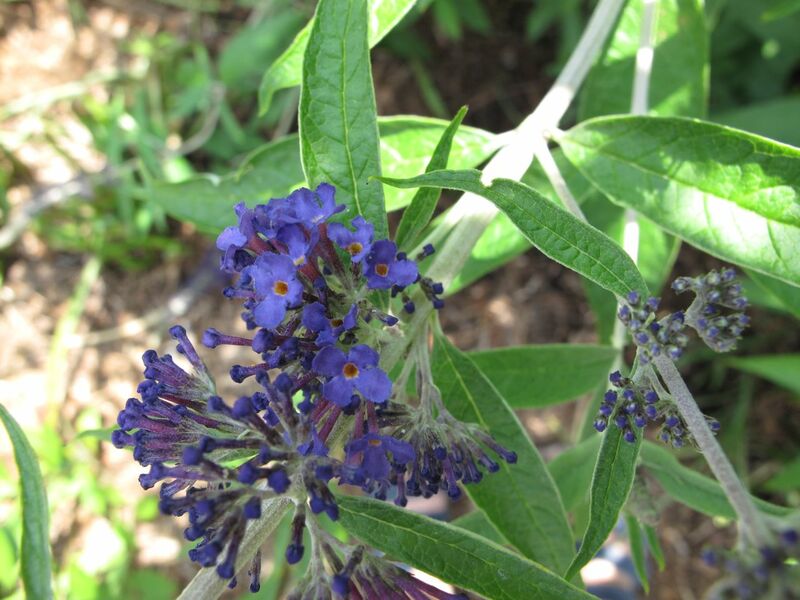 Nearby the first clusters of flowers have opened on the Butterfly bush (possibly Buddleja davidii ‘Black Knight’). 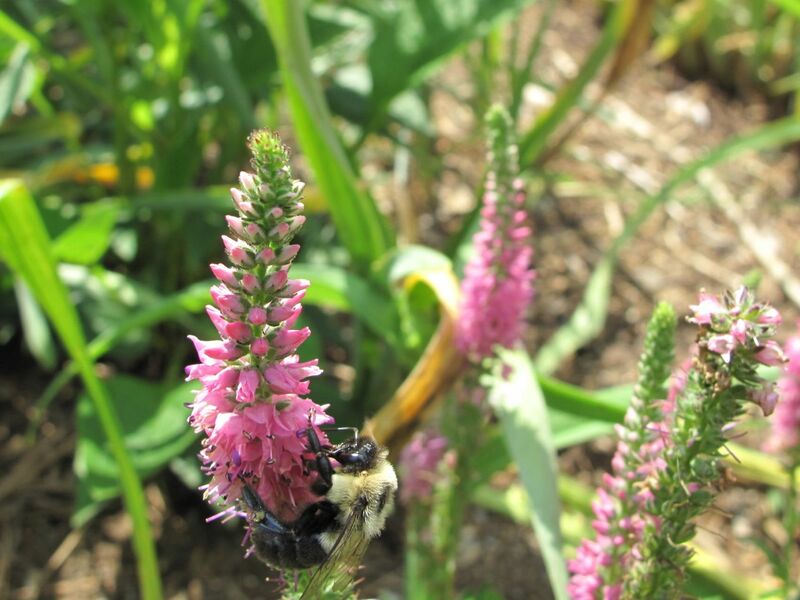 The bees are finding plenty of food, including this Veronica spicata ‘Pink Goblin’ (Speedwell), which actually has been blooming for a few weeks now, not just starting today. It seems much revived after last night’s elaborate thunder and lightning storm that brought heavy amounts of rain. 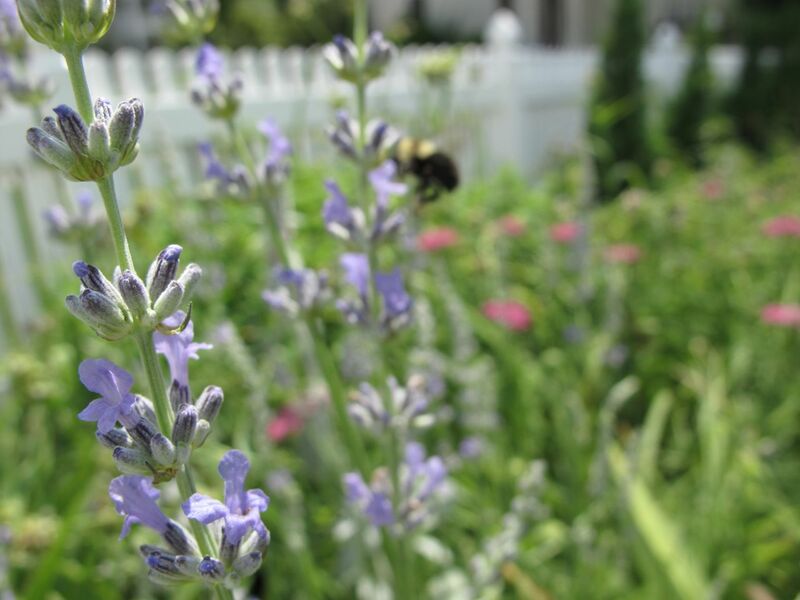 Pale delicate flowers of Lavender are open today at last and bees are finding it irresistible. In the background are drifts of pink Achillea and the ‘Blue Point’ Juniper hedge planted last year. 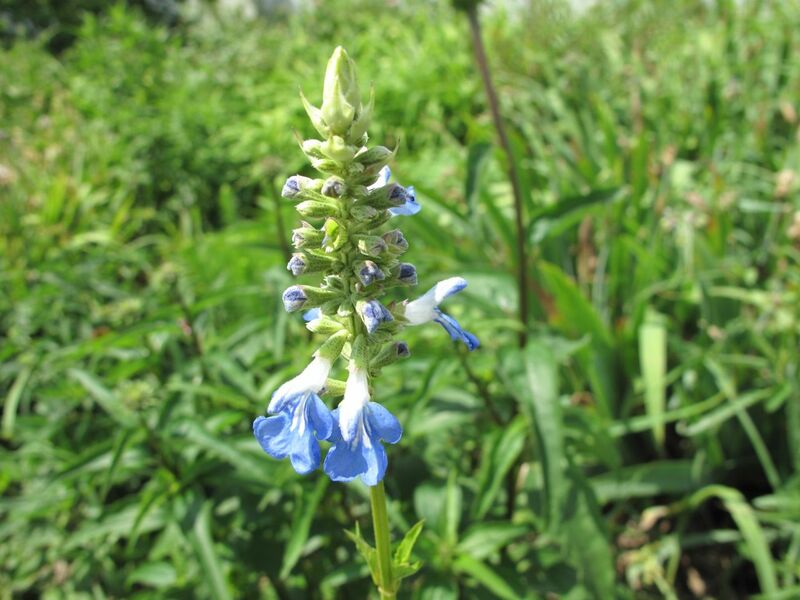 The first blossoms of Salvia ‘Blue Sky’ appeared today, revealing this flower’s characteristic azure blue brilliance atop a 5-foot flower stalk. 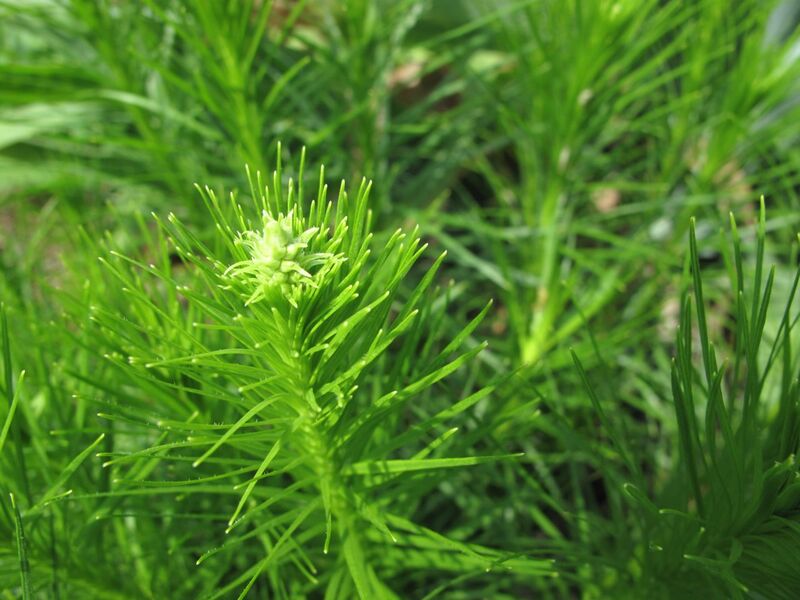 Liatris spicata ‘Alba’ is not quite open, but a little of the white flower is visible. The soft grass-like foliage provides a nice texture in the northern border. 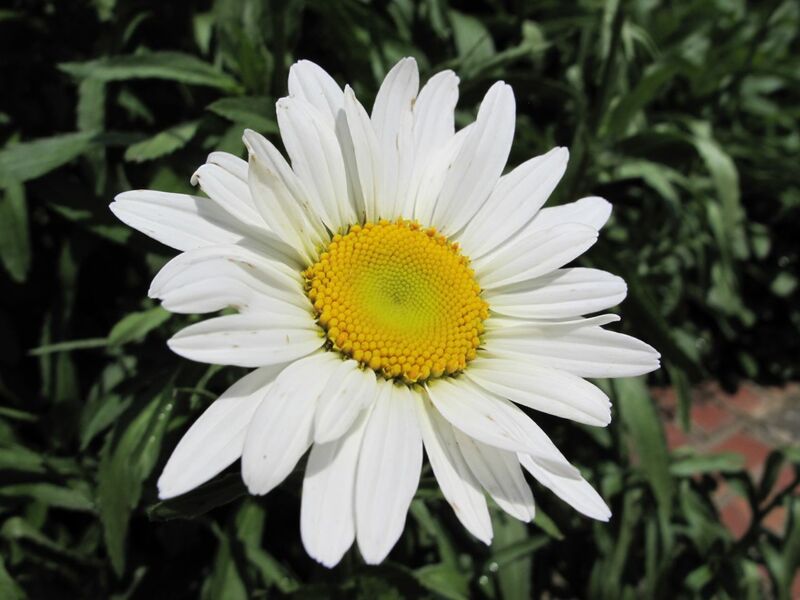 One more newly opened flower today, a cheerful Leucanthemum x superbum (Shasta Daisy). There are many large clumps of this herbaceous perennial all around the garden, so soon this single blossom should have plenty of company. This entry was posted in garden and tagged Buddleja, gardenia, Gardenia jasminoides 'Chuck Hayes', lavender, liatris spicata 'alba', perennials, photographing nature, photography, Salvia 'Blue Sky', shasta daisy, Veronica spicata 'Pink Goblin', yarrow on May 23, 2012 by pbmgarden. Just before ten this morning a bright yellow caught my eye through an upstairs window. 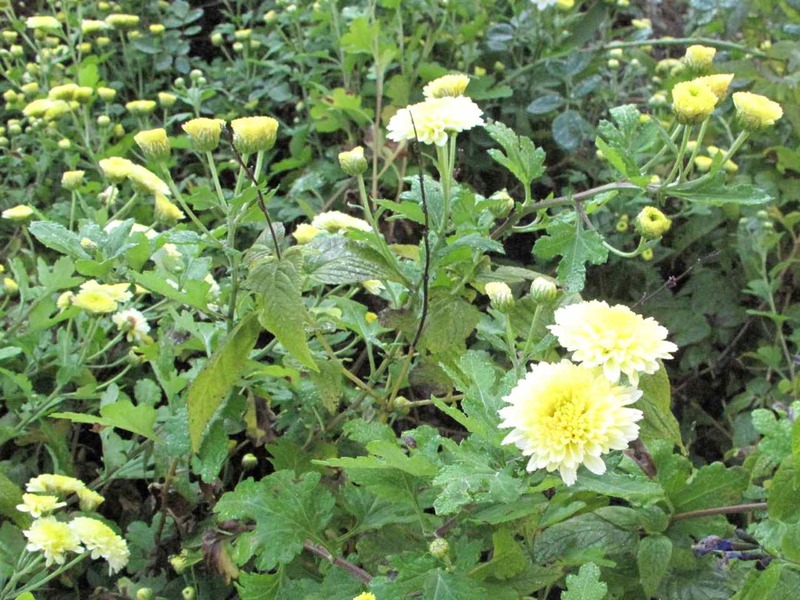 The sun had reached into the bed of chrysanthemums, awakening the southern border. These smallish yellow flowers are charming. 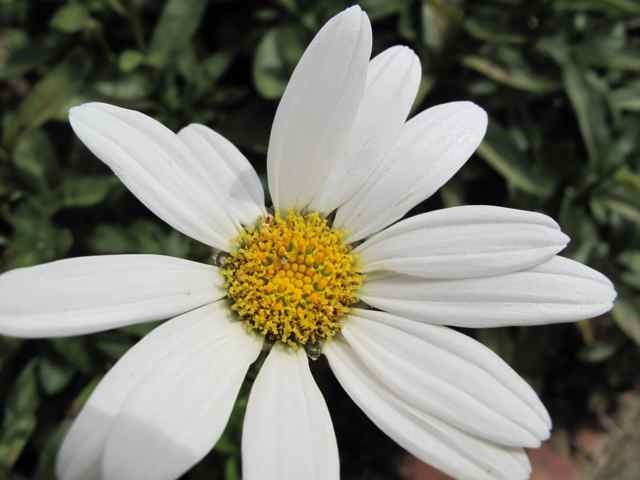 With edges that turn lighter, almost white, as they open, they are long-lasting and cheerful in indoor arrangements. This is an old-fashioned woody-stemmed chrysanthemum, passed along by an elderly cousin many years ago. 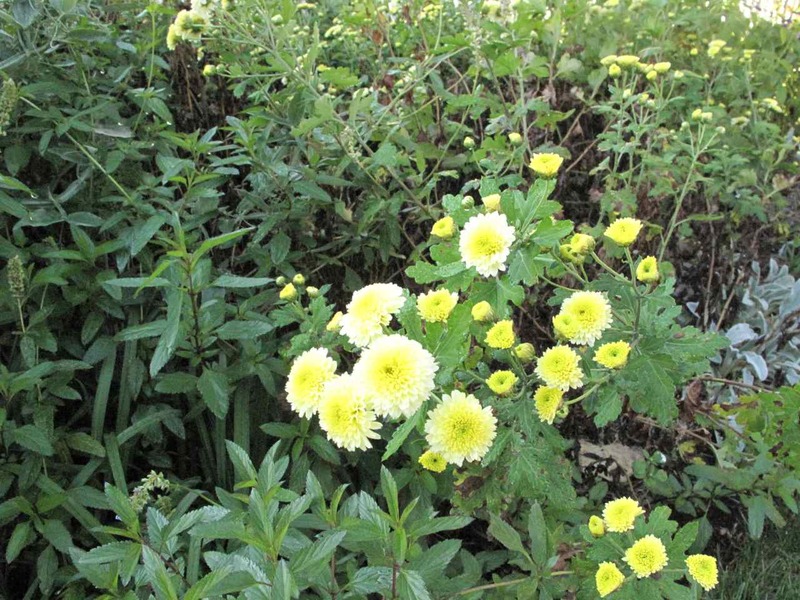 Unlike the tidy, mounding chrysanthemums frequently sold at garden centers and grocery stores alike, the growth habit of these is more unruly and sprawling. Perhaps with a little effort they could be contained and made to behave, but they actually work fine in this informal cottage-style garden. This bed does needs thinning though. Along with these chrysanthemums, Salvia ‘Blue Sky’ Salvia and Eastern Red Columbine are seriously encroaching into this spring’s new ‘Blue Point’ Juniper hedge. 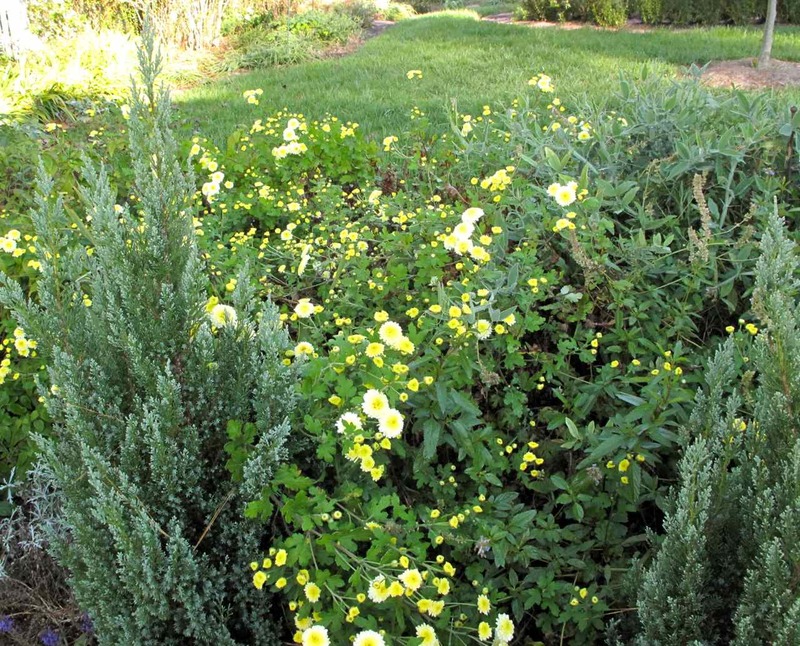 This entry was posted in garden and tagged Blue Point Juniper, chrysanthemum, pass-along plant, Salvia 'Blue Sky' on November 3, 2011 by pbmgarden. A walk around the garden yesterday revealed so many interesting blooms for mid-September, I wanted to continue documenting the state of the garden as Autumn approaches. 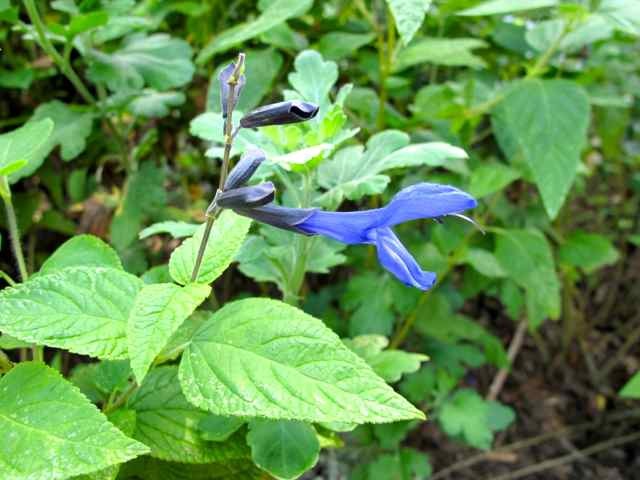 Salvia ‘Blue Sky,’ a “bring-along” plant from the former Wave Road garden, sometimes spreads too much for its surroundings, but it is easily manageable. 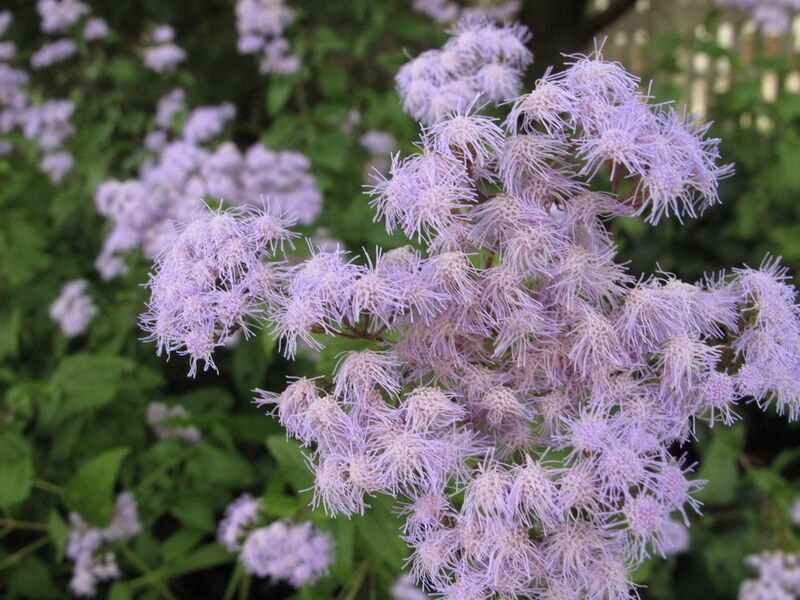 Reaching about 5 feet tall, it brings height and a cottage-like feel to the garden to the southern section of the border. 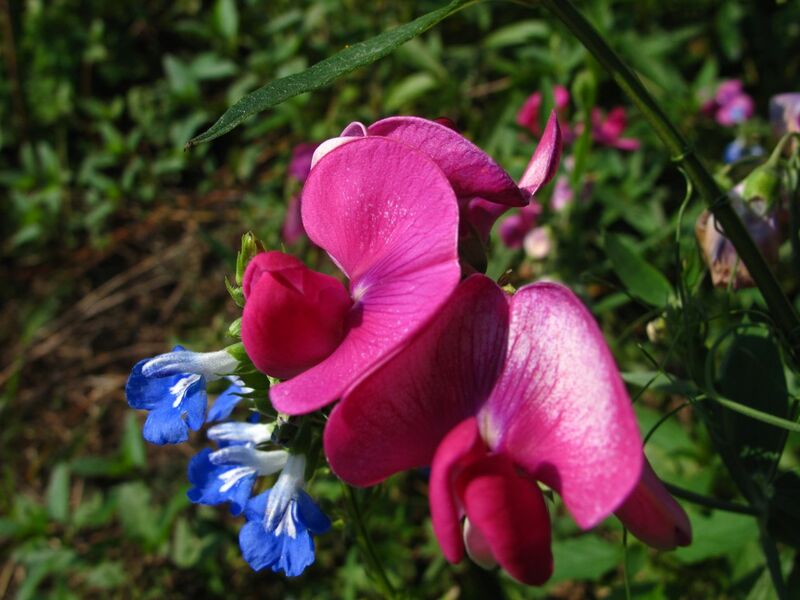 In the same area an old-fashioned sweet pea is paired with the ‘Blue Sky’ salvia evoking a nostalgic effect. This pairing occurred through happenstance, rather than planning. The sweet pea also made its way here from the Wave Road garden. It was one of many “pass-along” plants from a dear cousin. Not blooming, but worth a mention here while visiting the southern border, is this year’s new evergreen privacy hedge. The five ‘Blue Point’ Junipers installed in late February are growing well. They were chosen because they are deer-resistant and drought-tolerant and this seems to be the case. After these junipers were planted, the fence was added also as part of the garden renovation project. It is hard to remember how bare this area looked before these improvements. 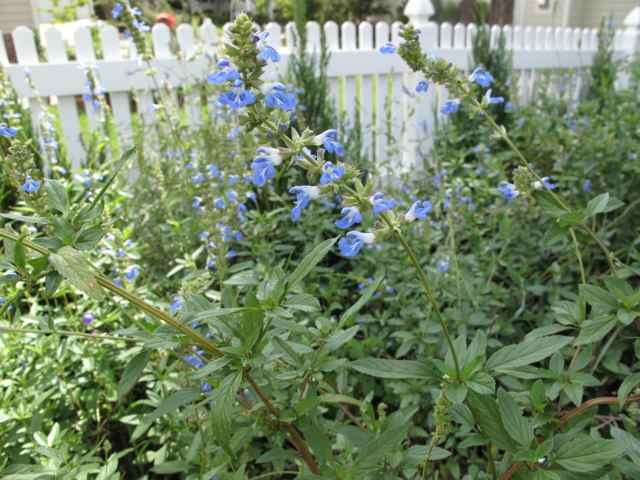 A few feet down the border is a small stand of Salvia guaranitica ‘Black and Blue.’ This salvia blooms well when given plenty of water and recents rains have brought out a plethora of deep richly-hued blue flowers. Tanacetum vulgare (Common Tansy), a pass-along plant from a former work colleague, has a pretty little yellow flower this week. 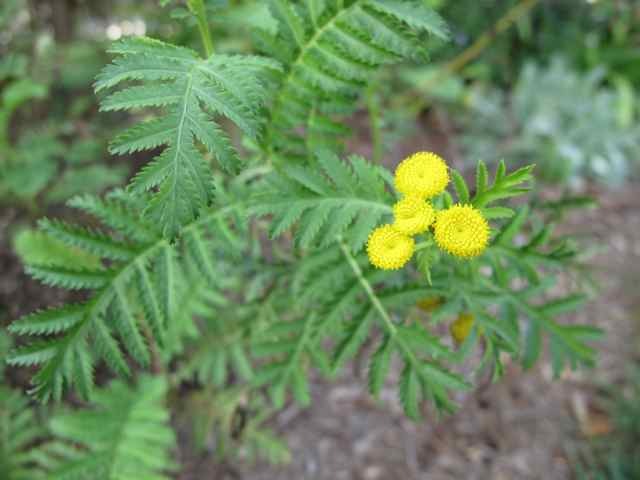 Skin contact with tansy causes a rash. A non-native it also is fairly aggressive and is difficult to remove once it spreads. 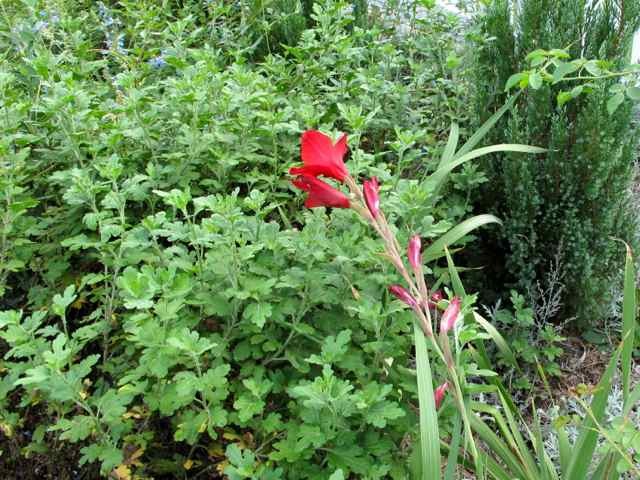 The heat and drought set in just as the red gladioli should have bloomed this summer. They dried up quickly. Apparently this one bid its time and waited for more moderate conditions. Discovered too late to bring inside, the gladiolus hid itself and is leaning into a large group of woody-stemmed chrysanthemums, which will have yellow blossoms in mid-October. 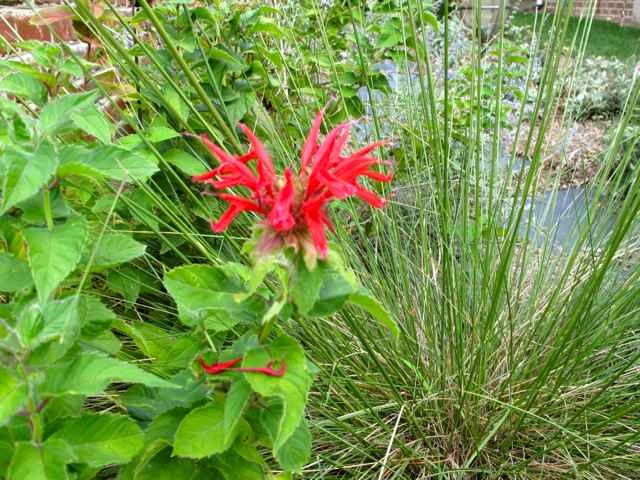 A surprise Monarda (Bee Balm) in the side garden contributes a spot of deep red next to an underperforming Pink Muhly Grass. Mid-September Blooms will be continued. 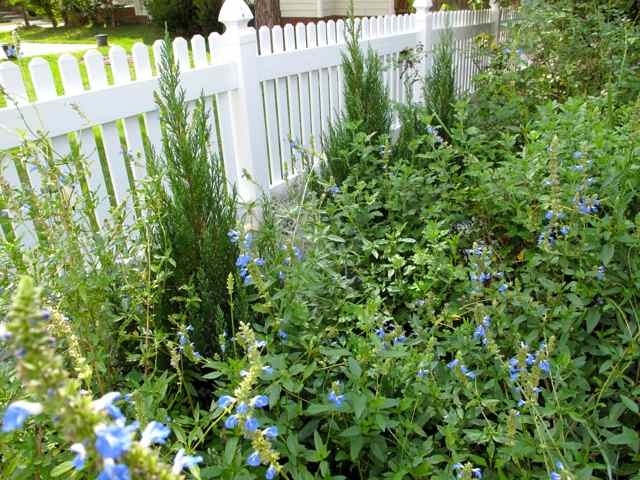 This entry was posted in garden, pbmgarden renovation and tagged Blue Point Juniper, chrysanthemum, gladiolus, monarda, pass-along plant, Salvia 'Blue Sky', Salvia guaranitica 'Black and Blue', sweet pea, tans on September 19, 2011 by pbmgarden. The garden has been completely on auto-pilot for the past eight weeks. 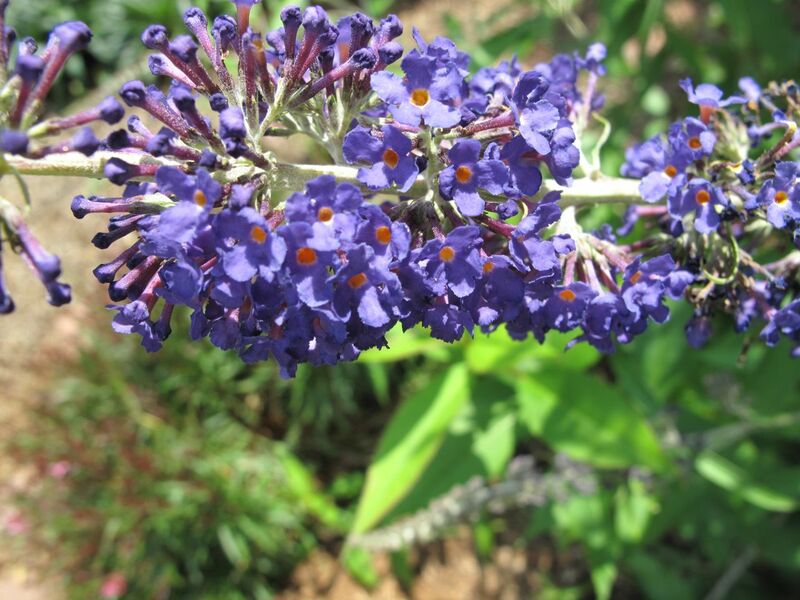 With July’s extreme heat and drought came parched plants and severe gardening lethargy. 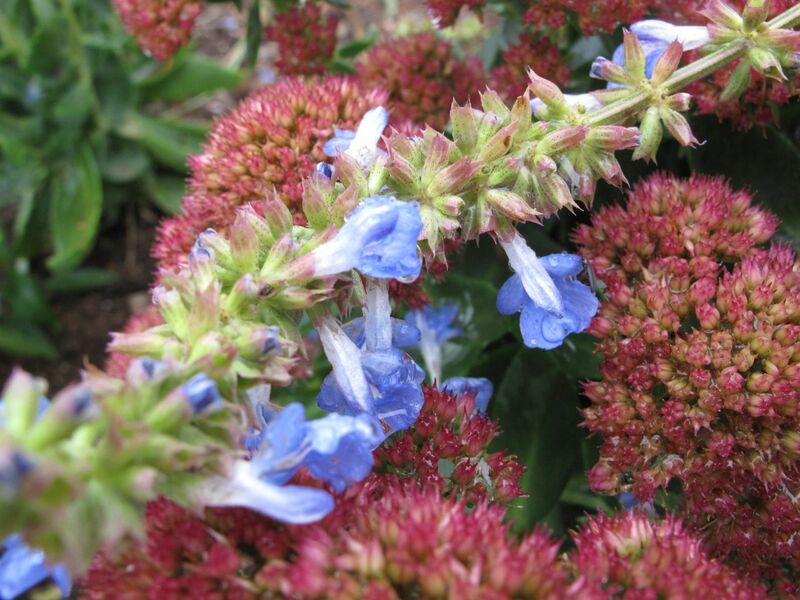 Then the months of August and September brought several important rains, and as is the way of gardens, this garden responded, sparking renewal in growth and interest. Touring and taking inventory today it was impossible not to revel in the multitude of blooms. 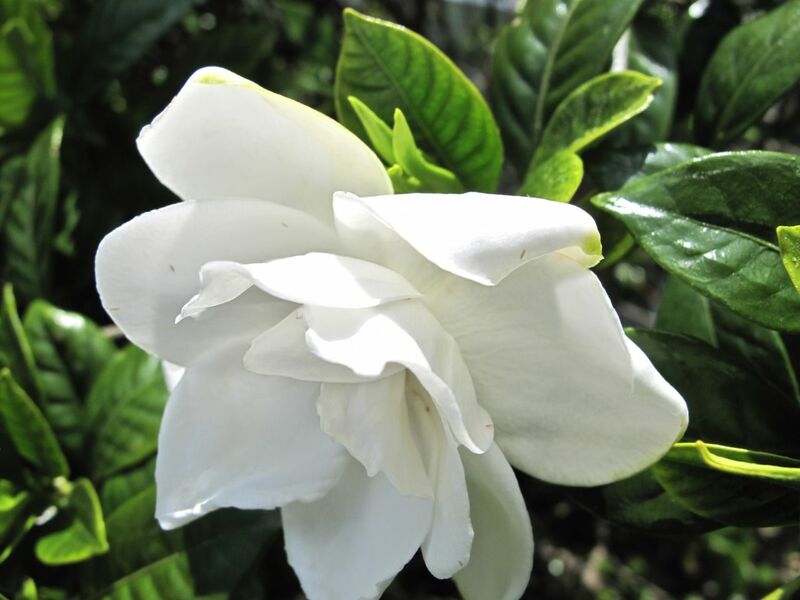 A few days into September the gardenias began blooming again, putting on a more magnificent show than in early June when temperatures in the mid-nineties forced them to struggle. 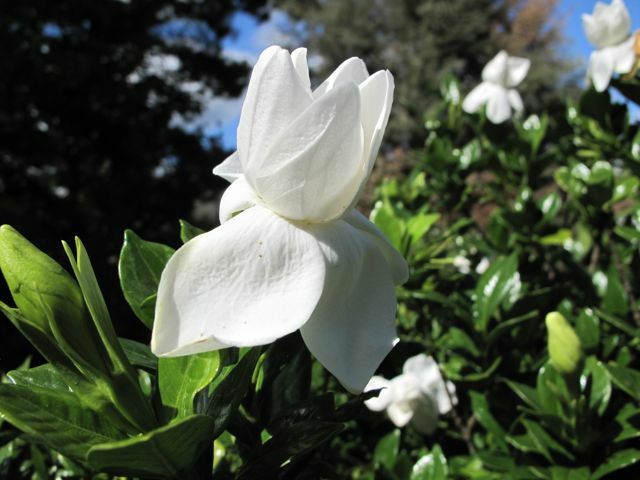 Now the air is filled with the lovely and unmistakable scent of gardenia. The Orange Canna adds height and interest to the east end of the side garden. 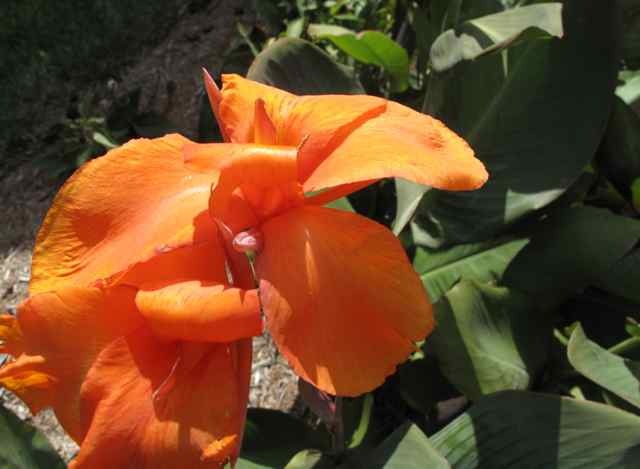 Throughout July the canna’s blossoms wilted almost immediately. Today its elegant blossom brightens this space again. A few Shasta Daisy flowers continue to bloom in different spots around the garden. The divisions transplanted in early Spring are healthy. 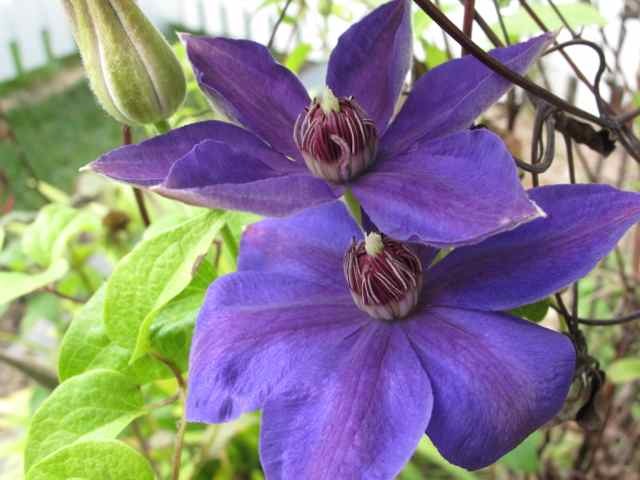 It was a treat to discover the Jackmani Clematis in bloom today. This is unusual for this garden. Again the rain seems to have made the difference. 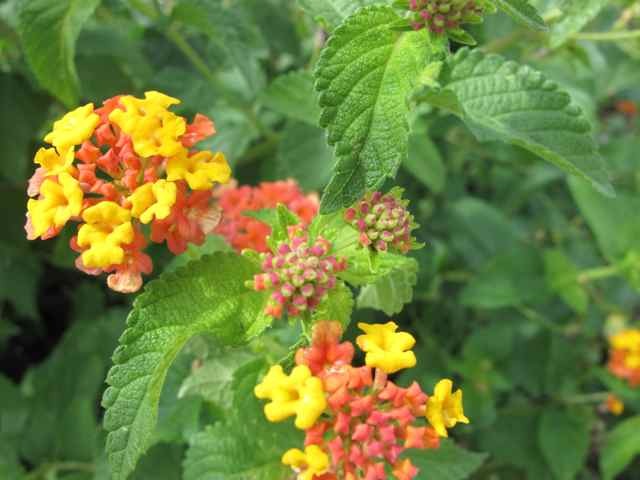 The lantana has been in this garden for ten years. It performed beautifully this year, one of those plants that does not mind the heat. The flowers in the meditation circle have held up well throughout the entire summer. The marigolds and angelonia withstand the heat and humidity brilliantly. 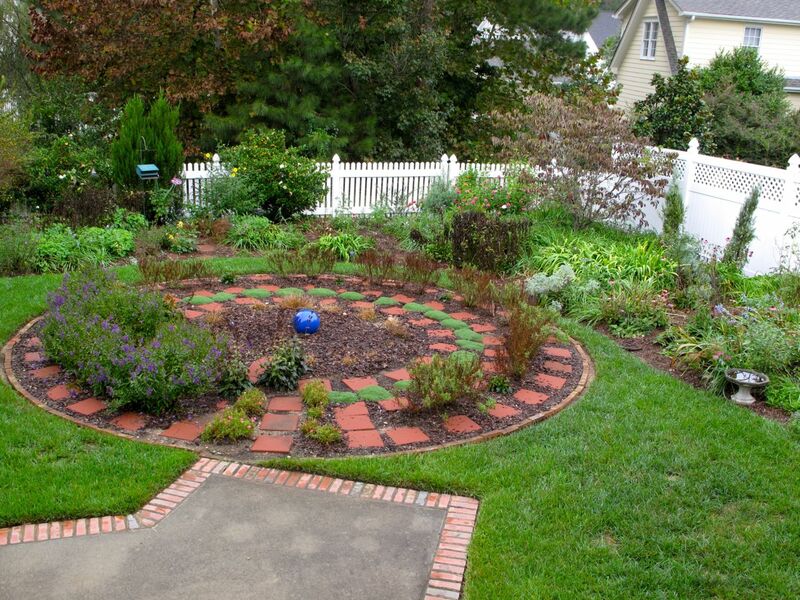 Both have spread beyond the 12-inch allotment of space between the stepping stones, but an occasional shearing works to restore order to the labyrinth and yields long-lasting bouquets to bring inside. The perennials in the circle, candytuft, thyme and penstemon, all performed well and look healthy. Between the two types of penstemon (Beardtongue), Penstemon Digitalis ‘Husker Red’ is the preferred choice. The 18 ‘Pikes Peak Purple’ Penstemons (foreground) have done fine but are more scraggly and flowers are not very showy–fine in their own right but not great accents for the labyrinth in the meditation circle. Many more flowers deserve mention today so this post will be continued later. 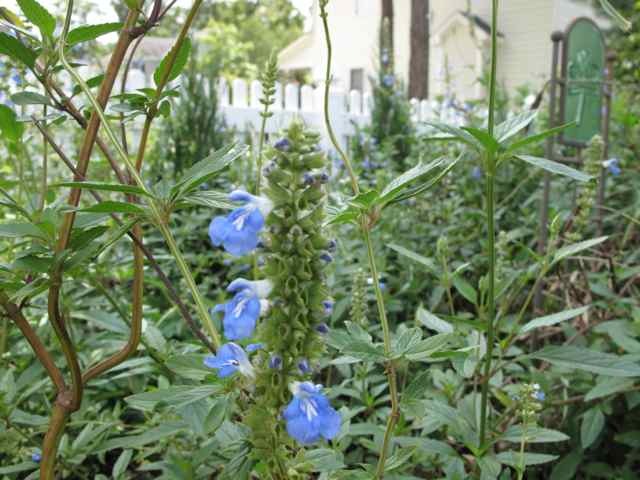 For a last glimpse at the garden today, here is Salvia ‘Blue Sky.’ This was brought from a former garden ten years ago. It is particularly lovely this year. 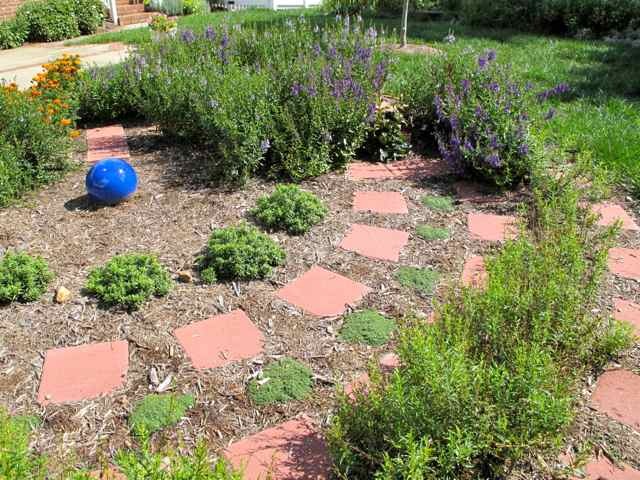 This entry was posted in garden and tagged angelonia, candytuft, canna, clematis, gardenia, labyrinth, lantana, marigolds, meditation garden, meditation path, penstemon, perennials, Salvia 'Blue Sky', shasta daisy, thyme on September 18, 2011 by pbmgarden.